This page provides basic information about the Gurmukhi script and its use for the Panjabi language. It is not authoritative, peer-reviewed information – these are just notes I have gathered or copied from various places as i learned. For character-specific details follow the links to the Gurmukhi character notes. Clicking on red text examples, or highlighting part of the sample text shows a list of characters. Click on the vertical blue bar (bottom right) to change font settings for the sample text. Colours and annotations on panels listing characters are relevant to their use for the Template language. Two types of transcription are used in this page: phonemic, and transliteration. The transliteration is based largely on ISO 15919, but with some changes mainly intended to ensure a one-to-one correspondence between characters. For example, two-letter sequences are handled by superscripting the second letter, such as ʰ in kʰ. Also, ᵃ is used to indicate the inherent vowel, and the virama is shown using a diacritic, as in k͓. More links for the Gurmukhi script. The Gurmukhi script is used primarily by followers of the Sikh religion in India to write the Punjabi language. Gurmukhi writing is historically derived from Brahmi, but its present form was developed in the 16th century by Guru Angad, successor to the founder of the Sikh religion, Guru Nanak. The word Gurmukhi means 'from the mouth of the guru'. Muslims in the Pakistani Punjab write Punjabi in the Persian script; use of the Persian script for writing Punjabi is called Shahmukhi. Gurmukhi (IPA: [ɡʊɾmʊkʰi]; Gurmukhi(literary means "from Guru's mouth"): ਗੁਰਮੁਖੀ) is a Sikh script modified, standardized and used by the second Sikh Guru, Guru Angad (1563–1606). It is used by Sikhs as one of two scripts to write the Punjabi language, the other being the Perso-Arabic Shahmukhi script used by Punjabi Muslims. The primary scripture of Sikhism, Guru Granth Sahib is written in Gurmukhī, in various dialects often coalesced under the generic title of Sant Bhasha. The Gurmukhi script is an abugida, ie. consonants carry an inherent vowel sound that is overridden using vowel signs. See the table to the right for a brief overview of features, taken from the Script Comparison Table. The following list describes some distinctive characteristics of Gurmuki script. The inherent vowel is pronounced ə and normally transcribed a. It is usually not pronounced at the end of a word. There are no unique shapes for independent vowels. Instead vowel-signs are added to one of three consonants that are used only as vowel carriers, however Unicode provides separate code points for all the combinations. Punjabi is a tonal language. Tones are normally indicated by the use of certain consonants, rather than diacritics. Although consonant clusters are frequent, there are very few conjuncts, mostly just r and h, which are subjoined. This leads to difficulties for automatic transcription. Consonant gemination is indicated, unusually for an Indian script, by a special diacritic that appears before the letter being lengthened. There are two diacritics for nasalisation, tippi and bindi, each used in different phonetic contexts. For character-specific details see Gurmukhi character notes. As an abugida, the basic unit of text is the orthographic syllable. Consonant clusters occur at the beginning of orthographic syllables, however they are generally not marked specially. Gurmukhi uses spaces to separate text into words. Consonants carry an inherent vowel usually transcribed as a and pronounced ə. So ਕ is pronounced kə. Unlike most other indic scripts, there is generally no indication when a consonant is not pronounced with a following vowel. (For the few occasions where this is made clear see the section consonantClusters.) Generally speaking, the reader simply has to know whether an inherent vowel is pronounced or not, eg. ਉਤਸੁਕ ʊ̣tsʊk utsuk curious. The inherent vowel is generally not pronounced at the end of a word (see the previous example). Gurmukhi uses ੍ [U+0A4D GURMUKHI SIGN VIRAMA] (called halant in Punjabi) to kill the inherent vowel after a consonant. It is rarely seen. As just mentioned, no virama is used at the end of a word, nor in many other situations. It is also usually hidden when the consonant is part of a consonant cluster. The virama is visible, however, if the consonant isn't followed by a consonant, eg. ਕ੍ k͓ explicitly represents just the sound k.
The virama may also be used occasionally to suppress the vowel in Sanskritised text, or in dictionaries for extra phonetic information. To produce a different vowel than the inherent one, Gurmukhi attaches vowel signs to the preceding consonant, eg. ਕੀ ki. Gurmukhi vowel signs are all combining characters. A single character is used per base consonant. Three of the vowel-signs are spacing marks, meaning that they consume horizontal space when added to a base consonant. Gurmukhi represents standalone vowels using a set of independent vowel letters. The set includes a character to represent the inherent vowel sound. ਅ [U+0A05 GURMUKHI LETTER A] is actually classified as a null consonant with an inherent vowel. In fact, all independent vowels in Gurmukhi are graphically a combination of one of the following three vowel carriers and a vowel sign. However while it's also possible to type them in this way, the Unicode Standard actually recommends that the precomposed characters be used instead. The precomposed letters don't decompose in Normalization Form D.
The use of the following characters is therefore deprecated by the Unicode Standard. Two separate diacritics are used to indicate nasalisation. 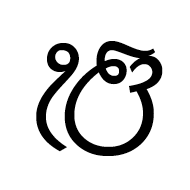 ੰ [U+0A70 GURMUKHI TIPPI] is used with vowels a, i, u, and with final ū, eg. ਮੂੰਡਾ mūŋ̽ɖā muɳɖɑ boy. ਂ [U+0A02 GURMUKHI SIGN BINDI] is used for all other vowels, eg. ਸ਼ਾਂਤ ʃā˜t ʃɑ̃t peaceful. These diacritics can also signal gemination of a following m or n.
Note that if a tippi is used in a location where bindi is more appropriate, some fonts may silently convert the shape to a dot. The word emergency contains both bindi and tippi. Gurmukhi has a set of consonants that mostly map onto the traditional Brahmi phonetic matrix, though not all are used for articulatory distinctions. ਅ [U+0A05 GURMUKHI LETTER A] is also classified as a null consonant and is described in independentvowels. ਼ [U+0A3C GURMUKHI SIGN NUKTA] is used to represent foreign sounds, particularly for Urdu or Persian, eg. in ਜ਼ਖ਼ਮੀ zˑxˑmī injured, the dot changes ਜ ʤ to ਜ਼ z, and ਖ kʰ to ਖ਼ x. The following graphemes combine nukta with an existing consonant. These graphemes are decomposed by Unicode Normalization Form C (NFC), however there are also a set of precomposed code points in the Unicode Gurmukhi block. The nukta should always be typed and stored immediately after the consonant it modifies, and before any combining vowels or diacritics. Gurmukhi doesn't normally use tone diacritics. Instead, certain character combinations serve to indicate high and low tones. The level tone is not marked. Five of the consonants – those nominally representing voiced, aspirated sounds in the Brahmi model – indicate changes in tone. The articulatory pronunciation is unaspirated and, when syllable-initial, unvoiced. When the letter ha follows a short i or u, it changes the vowel's phonetic value from [ɪ] and [ʊ] to [é] and [ó], respectively, and indicates a high tone. The diacritic ੑ [U+0A51 GURMUKHI SIGN UDAAT​] can also be used in older texts to indicate a high tone. Syllable-final consonant sounds are generally represented by ordinary consonant characters (or perhaps a conjunct with h for tonal indications). However, a final h can sometimes be represented by the visarga (ਃ [U+0A03 GURMUKHI SIGN VISARGA]). When the shapes of constituent consonants in a cluster are changed or merged to indicate the lack of intervening vowels, this is referred to as a conjunct. Clusters of consonants without intervening vowel sounds are generally not marked in Gurmukhi. There are just a few exceptions to that rule, and in each case the cluster is marked by a subjoined version of the second consonant. The character h in non-initial position is used to indicate tones (see consonant_tones). When the h follows a consonant, it is subjoined to it, eg. ਚੜ੍ਹ ʧɽ͓h ʧə́ɽ climb. Syllable-initial clusters also occur with r and v, and are also indicated using subjoined forms, eg. ਪ੍ਰਬੰਧ p͓rbŋ̽dʰ prəbə́nd̪ government, and ਸ੍ਵਰਗ s͓vrg svərəg heaven. Subjoined v is much less common in modern text. The way to indicate the above conjunct clusters is to add ੍ [U+0A4D GURMUKHI SIGN VIRAMA​] before the subjoined character, eg. ਪ੍ਰ is produced by the sequence ਪ + ੍ + ਰ [U+0A2A GURMUKHI LETTER PA + U+0A4D GURMUKHI SIGN VIRAMA + U+0A30 GURMUKHI LETTER RA]. Occasionally, a cluster ending with y is rendered using ੵ [U+0A75 GURMUKHI SIGN YAKASH​], eg. .ਕਲੵਚਰੈ kly̆ʧrɛ, though this appears to be quite rare. Doubling or reinforcement of a consonant sound is indicated, unusually for an indic script, using a diacritic, ੱ [U+0A71 GURMUKHI ADDAK​]. It is typed before the consonant (In this way it resembles the small tsu in Japanese), and is placed to the left of the consonant it affects (not over it), eg. ਪੱਕੀ p˖kī pəkki ripe. The diacritic may appear over the right side of the preceding consonant, but if that consonant has a vowel sign or extension above the horizontal topline, it may be displayed on a short extension of the joining line. See the example below for the Gurmukhi MT font when displaying ਭੁੱਲ ਭੇੱਲ ਉੱਛਲ. Placement of the addak diacritic. The Gurmukhi block includes the following combining characters, over and above the vowel signs described earlier. Follow the links for more information. 5 combining marks are used commonly for conjuncts, repertoire extension, gemination, and nasalisation (x2), respectively. 3 more are used infrequently for abbreviation, conjuncts, and nasalisation, respectively. ਃ [U+0A03 GURMUKHI SIGN VISARGA] is used to represent a final consonant (see finals), as well as for abbreviations (see abbreviation). 1 was used historically to mark tones. The Unicode Gurmukhi block has a single punctuation character, ੶ [U+0A76 GURMUKHI ABBREVIATION SIGN], but it doesn't appear to be much used. Gurmukhi occasionally uses sentence-final punctuation from the Devanagari block. Gurmukhi uses a couple of religious symbols. ੴ [U+0A74 GURMUKHI EK ONKAR] can have various different forms. Unicode classes it as a letter. The shape in the Unicode charts is highly stylised. The stylised shape of ek onkar in the Unicode chart. The other religious symbol, ☬ [U+262C ADI SHAKTI], is encoded in Unicode's Miscellaneous Symbols block. Gurmukhi generally uses western punctuation. Gurmukhi script is written horizontally and left to right. [ u ] The Unicode Standard v10.0 , Gurmukhi, pp475-479. Last changed 2019-04-12 6:38 GMT. • Make a comment. • Licence CC-By © r12a.